If the BBC is to take balance seriously, during the referendum period and beyond, it can’t leave panellists to voice untruths, unchecked. The majority of people in Britain are wrong about a significant number of key facts regarding the EU, according to an Independent report published on 10 June. On average, the public thinks that 15% of the British population is made up of EU migrants, or 10.5m people. The correct figure is 3.5m. Almost half of the population overestimate the amount of child benefit sent overseas by nearly 40 times. And 63% of people think the UK leaving the EU will reduce immigration, an assurance that the Leave camp has consistently failed to give. That people should be wrong about so many key issues at such an important stage in the vote is worrying, but it’s also not surprising. It’s unlikely anyone would argue that the debate surrounding the EU referendum has been anything other than a series of claims and counterclaims leaving voters largely uninformed about the choice they will be making. Question Time is a vital part of public debate; it is the only regular media forum in which ordinary people debate policy and hold politicians to account. In recent years it has adapted impressively to social media, with commentary on Facebook and Twitter included, giving it even more of a feel of a town hall hustings. That such an important part of public discourse might broadcast inaccuracies is therefore concerning – especially given how rabid anti-migrant rhetoric has formed a central plank of the Leave campaign. When audience members and panellists spread false arguments, particularly regarding issues affecting community cohesion up and down the country, Question Time must call it out. It must not allow itself to succumb to the general traducing of experts, information and research that has characterised so much of the referendum debate. 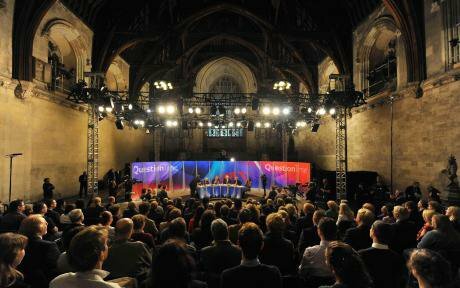 Question Time should remind audiences that facts matter. There have been too many times during the EU referendum where inaccuracies in the public domain have been allowed to fester. The independent, fact-checking platform Full Fact has been diligently fact checking all episodes of Question Time, and we include some of its findings here. While it is true that the UK cannot restrict the levels of EU migration, it is not accurate to say that we cannot control our borders. People in the EU still need passports to enter this country – and therefore we do control our borders. EU migrants can still be refused entry or deported within three months of arrival “for public policy, public security and public health reasons.” The longer EU citizens live in the UK, the harder it becomes to deport them. Even so, David Cameron agreed a deal with the EU on 19 February which “beefs up” exceptions to EU freedom of movement directives, meaning it is now easier for the UK to deport people. There is an important debate to be had about the effects of focusing on border control in terms of public discourse. Regardless of whether our borders are controlled; perceiving migrants as a threat which must be prevented from entering the country freely is bound to exacerbate xenophobia. In any case, Question Time should not allow Brexit to be presented as a panacea for the public’s anxieties over immigration policy. It is not – and if we leave the EU without reducing migration, it is likely public resentment will become even more of an issue. On the flipside, the Remain campaign has often been guilty of using Question Time as a platform to scaremonger about the economy. With the public listing the economy as one of the top concerns when it comes to the EU referendum, it is imperative that Question Time compels its panellists to be clear and accurate about the realities – especially as a perceived drain on the economy is likely to make people worry about public services and who is using them. It is not true that Norway contributes more. As FullFact puts it, “Our contribution to the EU budget as a fully paid-up member is expected to be around £220 per person over the next six years. Norway is expected to put in roughly £130 per person over the same period, although not into the central EU budget: this is mostly direct grants to poorer European countries, and fees for specific EU initiatives that it wants to take part in.” Of course we also get money back, but it is not possible to compare EU member states with non-member states in this context. Of course it’s very difficult for Question Time producer and Dimbleby himself to correct every piece of misinformation put forward on the programme, because it is impossible to predict what will be said on live television and therefore have every fact to hand. But in an age of what has been described as “post-truth” politics, Question Time must create an atmosphere in which facts are sacrosanct, and are prioritised over bluster. This week Michael Gove stated, “I think the people of this country have had enough of experts.” Maybe they have – but that’s not something to celebrate, especially when the electorate is wrong about nearly every key point of discussion over the EU referendum. This referendum, and the cesspit of discourse it has created, must be a lesson for us all: if inaccuracies are allowed to take root in the public domain, and if endeavours to correct them are dismissed as intellectualism, the results are ugly. In the future, Question Time should work harder to ensure its audience are properly informed by the time the programme has come to a close. Perhaps it could work with FullFact to publish fact checks at the end of every programme, or at the beginning of the programme that follows. The producers could even refuse to invite panellists who repeatedly make inaccurate statements. It is absurd that an institution as scrutinised as the BBC should give so much free rope to those who appear on it to trumpet their own biases, and the divisive sentiments whipped up by the EU referendum are a signal that Question Time can no longer allow this to stand.